What They Say.....Part love story, part workplace drama, this sharply observed novel is a witty critique of the false judgments we make in a social-media-obsessed world. New York Times bestselling author Sophie Kinsella has written her most timely novel yet. 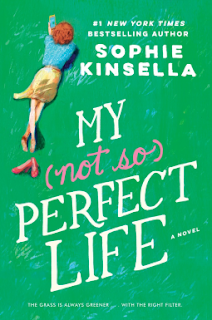 What I Say....I'm a huge Sophie Kinsella fan, so I was so excited to get her latest book. An it was as good as all of her books are, but it was a little different than the usual Shopaholic fare. Katie is from a small, rural town. After growing up without any money, she is itching to move to the big city and live the glamorous life that she see on Instagram. So Katie moves to London and reinvents herself on social media into a glamorous career girl who lives an exciting life with her many friends. The reality is that she has gotten a job that pays her nothing, and she spends her time taking pictures of things she hasn't bought, food she hasn't eaten and places that she doesn't live in. Katie has a budding romance with the the company owner's son, and things seem to be looking up when she suddenly finds herself fired by her boss from Hell, Demeter. This was a fun read, but it also had a little more "real life" in it than the normal Kinsella novel. It's always a risk when a best selling author strays from their formula in any way, but this was a home run. And a timely reminder to live your life, don't instagram it.